You wanna be on top? Act now! 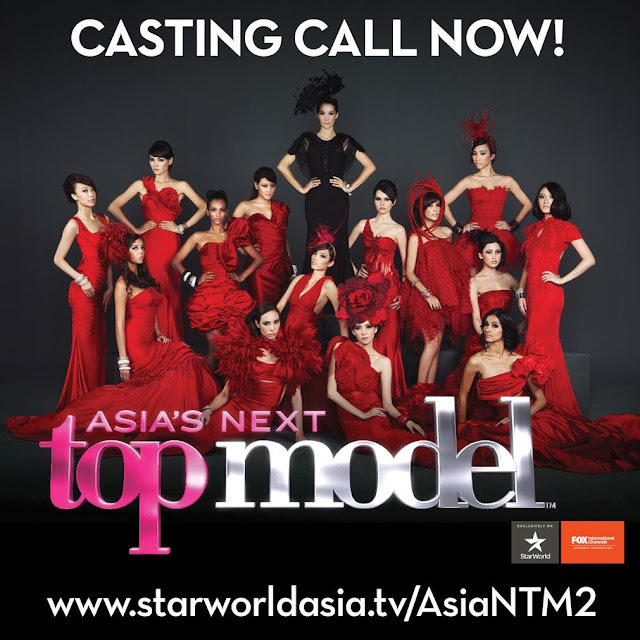 Casting call opens across Asia for Asia’s Next Top Model Cycle 2. Aspiring models looking to strut their stuff on international runways or appear on the covers of international glamour and fashion magazines can take delight as, Star World, the premiering channel of Asia’s Next Top Model, has announced details to the official Casting Call to search for Cycle 2 of Asia’s Next Top Model. Interested models looking to claim the title of Asia’s Next Top Model are required to submit their applications either online or via mail, as well as attend the Casting Call in Singapore on Saturday, 17 August 2013 at FOX International Channels Recording Studios at New Tech Park, 151 Lorong Chuan, #03 - 01. The hit series which debuted last year will feature Asia’s top modelling talents that will go on to compete for the crown and a coveted modeling contract with a top modeling agency, along with a cover shoot and photo spread with a well-known fashion magazine. The finalists will be put through a series of model challenges and vie for the approval of host, Nadya Hutagalung, and her team of modeling experts. Singapore is the final city to be holding its auditions, following in the steps of other countries in the region including Manila (9 Aug), Kuala Lumpur (11 Aug), Jakarta (13 Aug), Bangkok (15 Aug). Females of Asian descent aged between 16-27 who are at least 170 cm tall, have a sparkling personality and are able to “smize” are most welcome to join the contest. Asia’s Next Top Model Cycle 2, a FOX International Channels Original Production, will return to Star World (Singtel mio TV Ch. 301 and StarHub Cable TV Ch. 501, 555 (HD)) on 8 January 2014 (Wednesday) at 9.40pm with repeats on the following Sunday at 7.50pm and 10.35pm. You wanna be on top? Act now cos the audition is later!!!!!! Sorry for the belated post, but I thought to share this to people who secretly covets to strut down that runway with people cheering for you. Now that the internationally-famed show is in town, take a leap of faith for who knows, you may be the next top model. Chase your dreams my friends!